Movie theaters may receive complaint letters such as this about service, line length, movie choices, or food quality. 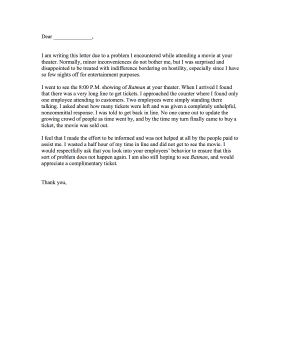 I am writing this letter due to a problem I encountered while attending a movie at your theater. Normally, minor inconveniences do not bother me, but I was surprised and disappointed to be treated with indifference bordering on hostility, especially since I have so few nights off for entertainment purposes. I went to see the 8:00 P.M. showing of Batman at your theater. When I arrived I found that there was a very long line to get tickets. I approached the counter where I found only one employee attending to customers. Two employees were simply standing there talking. I asked about how many tickets were left and was given a completely unhelpful, noncommittal response. I was told to get back in line. No one came out to update the growing crowd of people as time went by, and by the time my turn finally came to buy a ticket, the movie was sold out. I feel that I made the effort to be informed and was not helped at all by the people paid to assist me. I wasted a half hour of my time in line and did not get to see the movie. I would respectfully ask that you look into your employees' behavior to ensure that this sort of problem does not happen again. I am also still hoping to see Batman, and would appreciate a complimentary ticket.